What does the term "A-Game" mean in the world of poker? 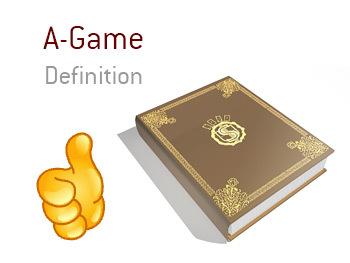 What is the definition of the term "A-game" in poker? In poker, playing your "A-Game" means that you are performing at your highest possible level. This means that you are focused, taking notes on your opponents and using this information to your advantage, and making smart decisions. Poker can be a mental strain - sitting at the table for hours straight will usually result in mental and physical fatigue. It can be difficult for players, especially casual ones, to play their "A-game" for 10-12 hours straight, which is why making it to the World Series of Poker final table is such an impressive accomplishment. Most professional poker players are able to play their "A-game" for extended periods of time, as they have had plenty of practice with long sessions. Of course, even if a player is playing their "A-game", there is a chance that they might not do well. In poker, you need to have the cards falling your way as well - a player who is mentally fatigued can still get lucky and outdraw you. Playing your "A-game" for extended periods of time means taking care of your body and building your mental sharpness. If you notice, many of the world's top players (including Daniel Negreanu) are those who take care of themselves.